WOW! What a charming, romantic indie drama we have here. This trailer seriously put an ear to ear smile on my face and I'm not going to lie, it almost brought a tear to my eye. Lovely, Still stars two phenomenal (Oscar winning) actors – Marin Landau and Ellen Burstyn. 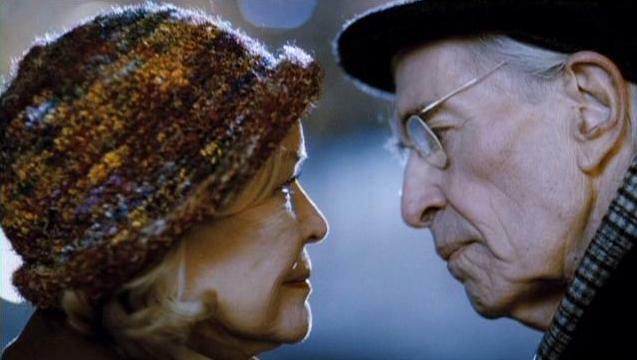 Landau plays an elderly chap discovering love for the first time with Burstyn. Adam Scott and Elizabeth Banks also star in this, as well. This just looks like one of those delightfully warm and refreshing films. It's not for everyone, but I really want to see this. Have a look! Lovely, Still was both written and directed by first-time feature filmmaker Nicholas Fackler, a 24-year-old up-and-coming filmmaker from Nebraska - wow, that's incredible btw. This first premiered at the Toronto International Film Festival back in 2008 and also played at the Milwaukee and Chicago Film Festivals. Monterey Media is finally bringing Lovely, Still to limited theaters on September 10th. This looks great! This does look charming. I'd see it. I would definitely see it. Let's see it together. The trailer made me cry! And I LOVE Ellen Burstyn so I'm in for sure!